Mary-Lou Pickles, director of the Office of Financial Services, and Greg Rockwell, accounting director. 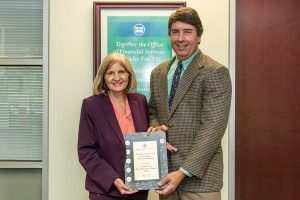 PALATKA, Fla., Nov. 15, 2018 — The St. Johns River Water Management District has been awarded the Certificate of Achievement for Excellence in Financial Reporting for its fiscal year 2016-2017 Comprehensive Annual Financial Report (CAFR) from the Government Finance Officers Association (GFOA) of the United States and Canada. District Accounting Director Greg Rockwell also was recognized. According to GFOA, the Certificate of Achievement is the highest form of recognition in governmental accounting and financial reporting and its attainment represents a significant accomplishment by a government and its management. The CAFR was judged by an impartial panel to meet the high standards of the program, which includes demonstrating a constructive “spirit of full disclosure” to clearly share financial information. Rockwell received an Award of Financial Reporting Achievement as the individual primarily responsible for preparing the award-winning CAFR. 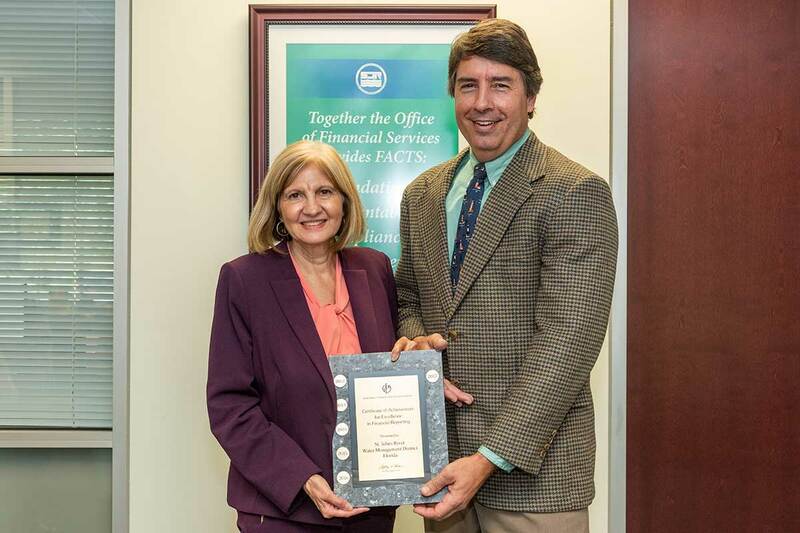 The GFOA’s Certificate of Achievement for Excellence in Financial Reporting is the only national awards program in governmental accounting and financial reporting. Headquartered in Chicago, Ill., GFOA is a major professional organization serving the needs of nearly 19,000 appointed and elected local, state and provincial level government officials and other finance practitioners.